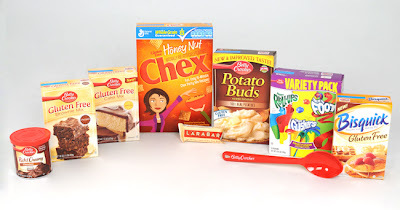 Live Gluten Freely is an online community created by General Mills that offers gluten-free product news, articles and real-life stories from participants. The site also provides recipes, ranging from breakfast treats like Blueberry-Corn Muffins to dishes like Favorite Chicken Nuggets to desserts like Brownie Ganache Torte with Raspberries and Carrot Cake. General Mills offers more than 300 gluten-free products, available in grocery stores nationwide. Keep up with new additions to the gluten-free list by subscribing to the Live Gluten Freely Newsletter. Every month, you'll receive recipes, tips, coupons for gluten-free items, new product information and more delivered directly to your inbox. Click here to sign up. Also, be sure to visit Live Gluten Freely on Facebook. "Like" the page and check out recipe ideas, product news and tips about living without gluten. To enter the giveaway, leave a comment to this post about your favorite gluten-free friendly restaurant in the Delaware Valley (southeastern Pennsylvania, southern New Jersey and northern Delaware). Some brief guidelines: (1) please do not enter unless you or a family member is on a gluten-free diet; (2) one comment per person; (3) U.S. residents only. Most important is to make sure your comment provides a way for me to contact you. If your comment does not link back to an email address, blog or website through which I can get in touch with you (some past entrants have blocked their Blogger profiles), post your email address in the comment in the following format: "name[at]domain[dot]suffix." The giveaway runs now through Sunday, October 31 at 11:59 p.m. Eastern Time. I’ll randomly select one winner the next day and will contact him or her by email. If I don’t hear back from the person with his or her mailing address by the following Tuesday at 8 p.m. Eastern, I’ll select another name. DISCLOSURE: MyBlogSpark has provided me with product samples, product information and is offering the prize pack. Neither I am nor any immediate family member is an employee, officer, director or agent of MyBlogSpark or its respective parent, subsidiary and affiliated entities, advertising and promotional agencies. My full Disclosure Policy can be found at the blog's Disclosure page. Our favorite GF restuarant is Grandma's Grotto in Horsham, PA!!!! Great food, selection and knowledge about GF cooking/cross contamination. My favorite gluten free restaurant is the new PBandU in wayne. The different and creative peanut butter combos can all be put on GF bread, and they give you lay's potato chips instead of sun chips. I love the GF sandwiches from the B2 cafe in Philadelphia, PA. So delicious! I absolutely love Maggianos's in Center City!! The Chef and Sous-Chef are always a pleasure to speak as well well as work with. They are always very accommodating, knowledgeable and willing to work with me in every way possible! Another vote for Grandma's Grotto! A LARGE GF menu, and amazing desserts - can't tell they're GF at all. Giorgio's on Pine in Center City is FANTASTIC!! The GF pasta and pizza is delicious and it's even a BYOB!! The owner is Italian, from Rome, and makes you feel very comfortable and at ease. The menu has all the GF items labeled and any pasta sauce can be made GF. A great dinner!! I haven't spent any real time in the Delaware Vally in recent years, other than to drive through. So the closest I can say was a meal I had at Tiffany's Tap and Grill up in Scranton this summer while visiting friends. They knew what gluten was, were able to answer my questions, the food was fabulous, and I left with no glutening symptoms. But if you come out to Madison, WI, I could certainly tell you many places to check out! sorry my email address for above post about Giorgios is deenakelly@gmail.com. Grandma's Grotto in Horsham has the BEST gluten free food! My 10 year old son absolutely loves Grandma's gluten free pizza. Everyone in our family is happy when we eat at the Grotto! Just had a lovely GF dinner @ Casona in Collingswood this week for my hubby's bday...gf chocolate cake, enchiladas, plantain chips, quesadillas, and empanadas. Ok, right now my favorite gf restaurant is Lamberti's Cucina in Feasterville at Bustleton & Street Roads. It is tucked in a little shopping center right off the corner. I recently went there for a wedding shower and they served me first, I felt like a queen. My dish (chicken and spinach) was better than all the other choices. This is a great place for lunch or dinner and the people there are very aware of serving gluten free food. You won't be disappointed. Jules Thin Crust Pizza in Doyelstown and Newtown PA. Excellent organic ingredients and the gluten free pizza is out of this world. I'm going to go with Sazon in Center City Philly. Almost their entire menu is GF and delicious, and the flan and hot chocolate desserts are amazing! After attending A4A, though, I did find a GF cannoli, and finally being able to eat my favorite treat brought tears to my eyes, so Grandma's Grotto may take the lead in my book as soon as I get over there to try the food and feast on cannolis. have only been gluten free for about 2.5 months so havent gone to that many restaurants yet. but my first was Grandma's Grotto in horsham very good pasta. Through this site(which i now love and live by) i have gone to the restaurant 99 on trooper rd finally had a burger with a gluten free bun delicious. Still Looking for gluten free "real pizza". One that doesnt taste gluten free. Tried peace of pizza in new hope the other day. it was good they make their own dough but its still not "real pizza". We love eating at Casona in Collingswood. I've had family from all over NJ come in for holiday brunches and birthday dinners, and there's always something new and interesting to try. We have several allergies in the family besides Celiac, and they've always been more then accommodating. Easy, Pasto Pomodoro in Voorhees, NJ. Awesome GF italian food. Gotta put in a plug for Paesano's (same owner as Modo Mio). One of the things my gluten-free hubby misses most is hoagie-type sandwiches, and Paesano's are better than great. I really enjoy the gluten free menu and the gluten free food at Bonefish in Newtown Square, Pa. There are not many gluten free resturants in the area so I have to return to the same few resturants. I am just so happy that I have somewhere to go and get out to get something to eat. I really appreciate so much the accomodations from bonefish! Also the companies that are taking the time to include gluten free :) I can be reached at guccigirl_102@hotmail.com BTW I love your blog! Has to be Pasta Pomodoro. Love making my own italian food and it is even better to go out and have someone else make it for you that tastes absolutely delicious! I too am a big fan of Bonefish. I have found some other GF friendly places near me but not a lot that have a GF menu. We are in Delaware (middle) and were so happy that we can stop at Seasons Pizza in Newark on our way home from my sons semiannual gastroenterologist appointment. My youngest is only 6 months, so we have not traveled far for dinner!! Distrito in Philly is to die for! The decor is excellent, they even have a special VW bug table for special occasions. They have a great tequila list and their menu is filled with superbly-delicious upgraded Mexican streetfare.